Ankle injuries are one of the most unexpected and annoying injuries you can have.An ankle sprain can occur while indulging in sports or due to asimple misstep or an accidental tripover an uneven surface. An Ankle Rehab System offers techniques to heal the injured ankle and protocols to strengthen your ankle to prevent future injuries. Hence, opting for a structured rehabilitation program is important for optimum recovery from ankle injuries. Ankle injury will result in a fair amount of swelling that impedes ankle flexibility and range of motion. Your Physical therapist will suggest icing to reduce swelling. 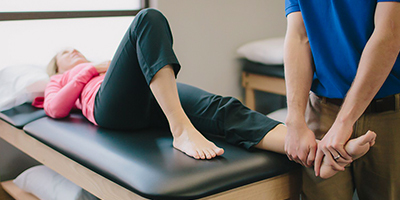 To improve your flexibility, your therapist may use exercises such as active movement and stretching.Simple movements such as rotating the ankle and flexing it in all directions can also help restore range of motion. Your therapist willthen incorporate the strength building exercises and ultimately focus on balance, endurance and functional activities such as climbing the stairs. If you have sustained an ankle sprain which results in swelling, bruising, tenderness to touch or instability of the ankle. Never do any activity that hurts your ankle. Of course you may feel some discomfort, but never push yourself to the point where you’re feeling pain. Do not ignore any pain. In case of any pain contact your therapist immediately. An ankle rehab program can help increase the much-needed flexibility in your ankles and build up supporting muscles that keep you balanced whether you are standing, walking, running on uneven surfaces or enjoying your favorite activities like dancing. Rehabilitation exercises are critical to ensure that the ankle heals completely and reinjury does not occur. If you have sustained an ankle injury opt fora rehab program to improve range of motion, strength, stability and function of your feet. Coping with an ankle sprain is no fun. Be more conscious of your steps and avoid ankle sprains.